The world has been invaded. Creatures that are devastatingly fast, heavily armoured, and blindly hunt any sound they hear have appeared in the world. Although we as an audience learn little about the creatures, it appears that humanity is unable to prevail against them, and hides from them in silence. In this landscape a family (Emily Blunt, John Krasinski, Millicent Simmonds, Noah Jupe) attempts to survive and remain quiet, for the merest sound can attract the fearsome hunters. 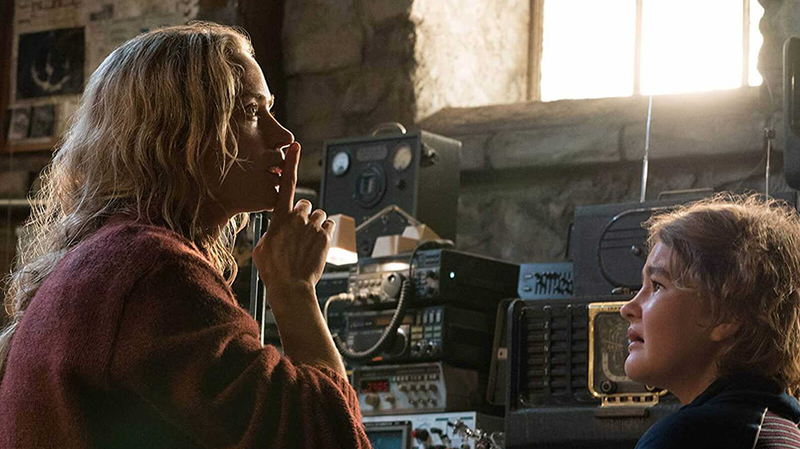 More than just a clever gimmick, a cheap trick to lure punters, A Quiet Place drills down into its premise incorporating it into the storyline and the tone of the film, quite literally. That lack of sound gives the film an ability to increase the tension of the piece, and it really does. You become so used to specific cues to give you a warning in horror, and often they are not so prominent in A Quiet Place. As a result the audience is kept in an increased sense of anticipation, as they listen for every creak, every slight noise. And when that quiet is broken, you certainly jump a mile. It is very effective at producing scares, some of the “jump scare” variety, but it does go beyond this to make you feel a genuine sense of terror for the characters. Having the central focus on a family unit, means you come to know each of the characters. These are not some bunch of random teens fed to a monster at intervals to remind audiences how the creature works – the fate of everyone here matters, and maybe not everyone will make it out. All of which is representative of an extremely confident and competent hand at the tiller. Extraordinary to see this is John Krasinski’s (The Office US version) first time at the director’s chair. Even more extraordinary to see him acting in it as well. Blunt does a lot of the heavy lifting in terms of the horror, but brings a lot more to it than just the usual “final girl” trope (or even the “action mom”). That silence and stillness means she has to convey more with the emotion and range of her performance, than merely dialogue. However it is Millicent Simmonds that is the true revelation, bringing such stubborn determination to the deaf Regan. Deaf herself at an early age, Simmonds brings her life experience into creating a believable performance. A great debut that straddles the line between horror and science fiction. In many ways A Quiet Place is a call back to classics such as War of the Worlds and Day of the Triffids, tapping into that same existential dread for the fate of humanity then taking it to the personal level of survival. But it’s damn effective in doing this.